We Indict! is an exhibition about grassroots activism, social engagement, and creating alternatives to existing legal systems. 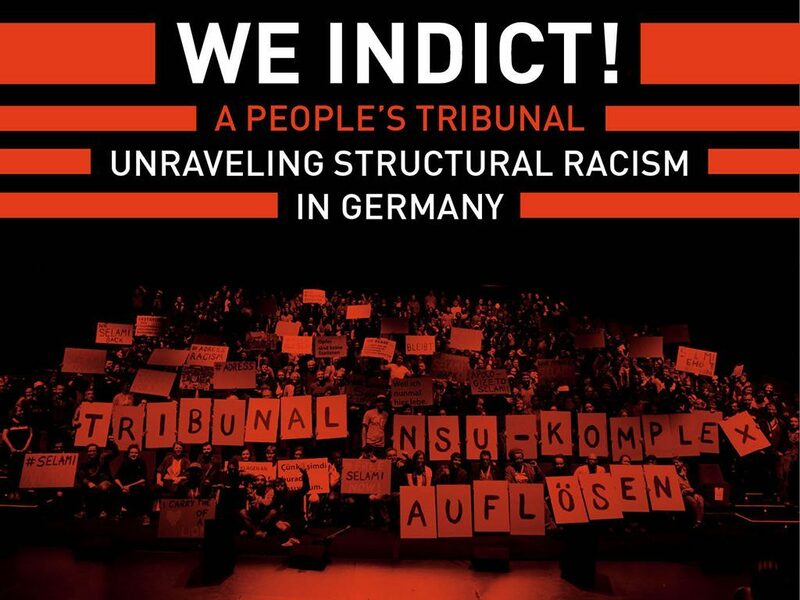 At its center is a Tribunal initiated by hundreds of anti-racist activists in Germany and assembled under the label “Unraveling the NSU Complex” at the Schauspiel theater in Cologne last May. The Tribunal unravels neo-Nazi terror and institutional racism by exposing the actions and network of the German extreme right-wing group known as “National Socialist Underground” (NSU). Following the Tribunal’s lead, the exhibition aims to contribute to the contemporary debate on racism, law, and justice. In defiance of the state’s paradigm of immigrant “integration” in German society, the Tribunal aims towards the implementation of a discourse-changing vision of Germany as a “society of the many.” At Ludlow 38, more than two hundred photos taken before, during, and after the Tribunal’s meeting in Cologne will be exhibited in a non-linear manner. Together, these images demonstrate a variety of campaigns and interventions carried out by activists across Germany reclaiming symbolic and physical space for representation. Advocating for the urgent need to tackle NSU terror from the perspective of immigration and from the point of view of the victims, We Indict! functions as a counter-archive to the German state’s legal system. The images, videos, and documents included in the exhibition were collected by the Tribunal and created by Ulf Aminde, Spot the Silence, SPOTS Audiovisual Micro-Interventions for TRIBUNAL – Unraveling the NSU Complex and beyond, and Forensic Architecture. The exhibition is curated by Avi Feldman together with Timo Glatz and Gesine Schütt. We Indict! Unraveling Structural Racism in Germany is the first of a series of exhibitions and events organized by The Agency for Legal Imagination to take place throughout 2018 at Ludlow 38.